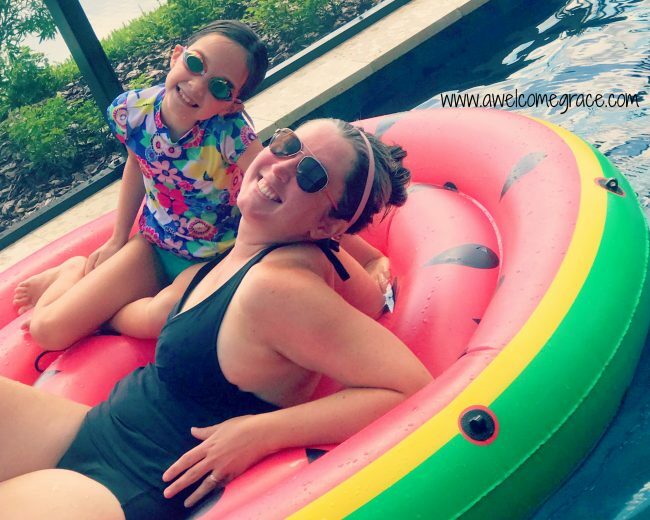 Moms, raise your hand if a bathing suit is one of your very favorite pieces of clothing to wear in public. OK, well, if your hand is raised, you can probably stop reading now. Because you are a rock star of epic proportions and certainly don’t need my help and support in this area. However, if your hand is still down…read on, warrior! I’ve got some thoughts on body positivity for the generally body-negative. We’ll talk tips and tricks for preserving sweet memories without making your self-esteem go down the crapper. 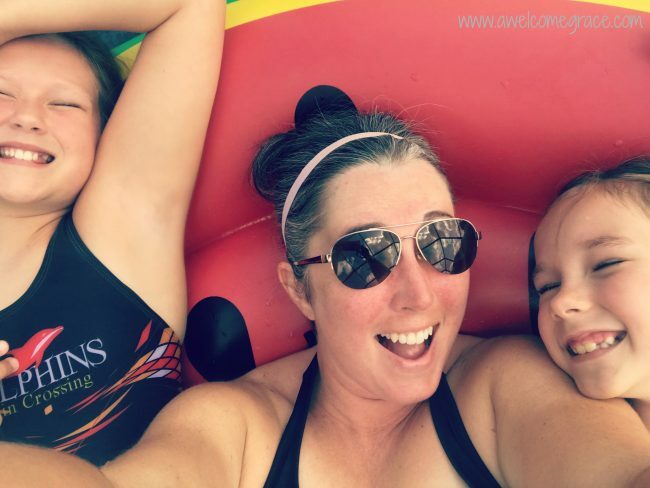 And I’ll share a moment of happiness with my own kids that will hopefully encourage you, too, to #wearthebathingsuit and breathe a little easier while doing it. Now, I’m going to come right out and say it. I am just about the least body positive person you will ever meet. Like most women, I definitely have a love-hate relationship with this earthly shell I have been given. My back is crooked and I weigh more now than I ever have in my adult life (not counting any time I was over 7 months pregnant). Throw in a couple other issues and dang! It’s really hard to look at this body of mine and see – much less feel – like it was made in the image and likeness of a good and gracious God. Do you get where I’m coming from? Here’s the thing, though. All that business I just shared? All that negativity? The only place any of that lives is in my own head. Think about the people you love most in your life and then let me ask you this. When you look at your husband, do you immediately see how he’s aged in the years you’ve known and loved him? Of course not! When you look at your children, do you see their flaws or do you just see miraculously beautiful humans? And when you look at your own mother, what do you see? Do you see wrinkles and varicose veins? Do you hone in on the ways she’s aged? No. You see the beautiful woman whose arms encircled you, the lap you sat on, and the face that you’ve stared at from the moment you were born. So, what do you think these same people see when they look at you? I’d venture to guess that when my girls look at this picture, they’ll tell you they see nothing but smiles. Someday, they’ll remember how we were all smooshed onto the watermelon pool float together. How they took turns pulling Mommy up and down the length of the pool. How we got caught under the water feature and couldn’t stop laughing. But do you know what I see when I look at this picture? My first glance goes straight to the soft, squishy rolls and the big upper arms. I see the flaw before the beauty of my girls’ smiles. I see what makes me uncomfortable before what makes me immensely joyful. What can I say? It’s a work in progress. Our focus as moms needs to shift, ladies! We need to put aside our own insecurities to build up that natural confidence our daughters have. I kid you not, I think putting our girls in swim team has done wonders for their physical self-esteem. Day in and day out through the summer, they see bodies of all shapes and sizes (including their own!) working hard and being strong. Isn’t that what it’s about? Appreciating the body you have not because of how it looks but because of what it can do? No. I don’t look like the 25 year-old version of myself anymore, but I will say that with age comes clarity. Would I go back in time and tell that younger version of me to wear the damn bikini if I wanted to and that really, my thighs were just fine? Of course. But I’m glad I’m learning these lessons now at the ripe old age of 41 and I pray that I can pass them on to my girls. Maybe, just maybe, by seeing me play in the water, sit in the sand, and wear the dang bathing suit with a smile on my face, they’ll learn that it’s not such a big deal after all. Now, all that is well and good, right? But we live in the age of Instagram and Facebook and (thank God) digital photography. We constantly have our cameras at our sides thanks to the joy of smartphones. We can have all the body positivity we want, but if you’re anything like me, you still want to look good in the dang picture! Holler if ya hear me! This might be an unpopular opinion in the true bo-po circles, but hear me out. Ladies, there is nothing wrong with angling your body to its best advantage and then cropping out parts that make you uncomfortable. I’m just going to go right ahead and say it. Angles, cropping, and a good Insta-filter are your friends! Now, I’m not implying that we should all go full Photoshop and retouch ourselves into unrecognizability (is that even a word?). That is just ridiculous and does no one any good. But if, with a little help from the edit button, we can make ourselves feel just a smidge better about the image we see? I don’t know about you, but for me, it tricks my mind just enough that it makes it easier to put on the bathing suit again and again. Here it is, friends. This is why we do it. This is why we put on the damn bathing suit and play with our kids. It’s not to glory in our size 14 body. It’s not about ourselves at all! I remember this day last month with such happiness. My mom and dad were visiting. I got to watch my dad have chicken fights in the pool with one of my girls on his shoulders while the other girl was on her oldest brother’s shoulders. My mom the singer and my son the trombonist had breath-holding contests under the water. There were canonball contests, races, and a whole lot of “Mommy, watch this!” And then they asked me to get in, too. When I hesitated due to my insecurities, this is what happened. My beautiful children came to my rescue. They encouraged me, loved me, and joined me. Truly. How lucky am I? This whole bathing suit business, moms? It’s truly not about you! Just like it’s not about me. It’s about laughter. Overcoming fear and anxiety. The laughs and cheers of children. Time with your family. Staying cool in the bazillion degree heat and humidity. So, for what’s left of the summer, can we do this together? Can we show our girls an example of loving kindness to ourselves and everyone around us? Can we #wearthebathingsuit and #doitforourdaughters? Yeah. I thought so. Now, go have fun!! And tell me all about it, will you? I’d love to help celebrate your successes!! 18 Summers? I Beg to Differ.